More Flow Cross Section than previous Milltek Non Resonated. 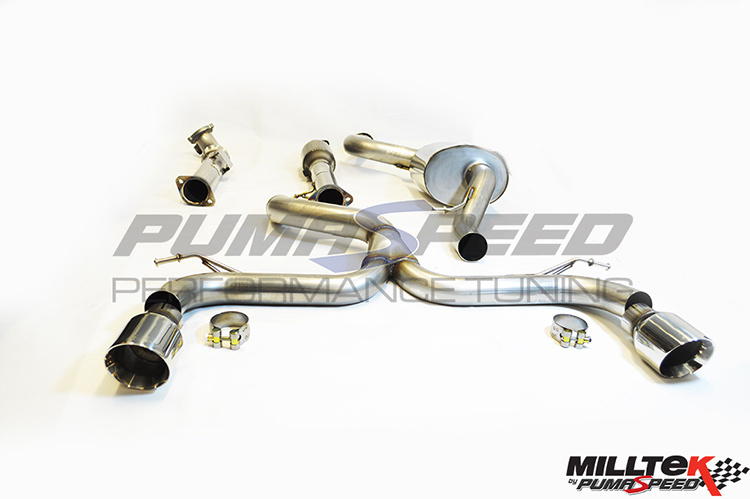 When Pumaspeed and Milltek Sport put 2 development teams to work to create the Ultimate Sports / Race exhaust for any Fast Ford you know that something quite special is going to emerge. With the New Focus Mk3 ST 250 arriving soon, the Milltek and Pumaspeed teams were given one final brief by Pumaspeed Managment to create the worlds most awesome Stainless Steel System as a final development goodbye to one of Europe's tuning favourites. A Focus on Quality but with a more attractive price. Drawing on the full experience of a dedicated development team, Milltek Sport suggested the use of the 350 bhp+ GOLF 'R' Race System as a basis for the new Pumaspeed Ultimate System. Full 3 inch bore pipes were used, a single premuim quality Mid box was used ,very similar to the existing Focus RS mk1 system. The Golf 'R' rear Y pipe design and the genuine GOLF 'R' tail trims were used. (This is the De-Cat / loudest version available) we advise the quieter 127mm Sport cat Version..
Will this unit fit to my existing system ? All the flanges are made to stock location points so all the parts from Ford, milltek,piper, mongoose etc etc etc are totally interchangeable. The Pumaspeed Workshop team are ready to fit the Milltek Sport Ultimate Ford Focus ST 225 Sports Cat Turbo Back Race System in our Head Office located here. Therefore making parts and labour a total cost £1,296.00 (inc. VAT). Pumaspeed have a specialist distribution team that can dispatch the Milltek Sport Ultimate Ford Focus ST 225 Sports Cat Turbo Back Race System to any destination worldwide.